Is the enclosure suitable for adult tortoises? Is it suitable for babies of any species? Certainly for all of the common Mediterranean species commonly found in the pet industry within Europe, such as hermanns, spurthighs, horsfields, marginated, etc, etc. For tropical species such as Indian Star tortoises or redfoots extra humidity would be required. What type of lamp should I use? You can use either a hanging lamp, or a clamp lamp. The bulb should be a combined heat/UVB bulb. Generally speaking a combined heat/uvb bulb of approximately 100 watts should provide a warm spot of approximately 30*c directly underneath the beam of the bulb. Can the lamp be positioned directly in the middle of the enclosure as shown in the video, or should it point towards one end only? In bygone days when people used to keep tortoises in completely enclosed vivaria it was necessary to have the lamp at one end only, to try to form a heat gradient. This was essential because waste heat would be trapped within the vivarium as it had no way of escaping. However because our Tortoise Home is completely open-topped the practice of trying to form a heat gradient by placing the lamp at one end is now no longer necessary. In all open-topped enclosures such as ours the bulb will only warm the immediate footprint of the beam directly underneath the bulb. Away from the immediate footprint of the bulb the temperature will be at the normal ambient room temperature. This is because all unwanted waste heat rises upwards and out of the enclosure. Therefore you can actually position the lamp anywhere you want to, as the tortoise will have exactly the same surface area of “cool areas” regardless of where you situate the “warm area”. Thus a tortoise can correctly thermoregulate its body temperature by walking in and out of the beam of light as it sees fit. In short, it’s perfectly fine to have the lamp pointing directly in the middle. I’ve heard tortoises get stressed by glass, is this true? However, it is an extremely common misconception even in this day and age. The misconception was born out of some poorly written literature in the 1980’s. The author wrote that if a tortoise can see through an object it will try to walk through it, and thus stress the animal. This lead to tortoise enthusiasts of that time thinking that their charges would constantly make a bee line for any transparent walls, thinking there wasn’t a barrier there. Sadly this misconception still lives on today. What the author should have said was if a tortoise can “smell” through a gap it will try to get through it. This is of course referring to pens made of mesh or wire as was commonplace in the 70’s and 80’s. With solid structures, such as glass walls for example, a tortoise has by far the applicable mental capacity to realise its there, regardless of whether its transparent or not. Exactly the same as any other reptile would i.e. snake, lizard, crocodile. In fact, with a tortoise, so astute is their sense of smell that you could blindfold it and it would still realise a barrier is there. All of our tortoise experts make use of greenhouses as part of their adult accommodation. Not once has any tortoise walked through a pane of glass. In short, are tortoises stressed by glass? No! Loamy topsoil is excellent for 99% of tortoises commonly seen in the hobby today. Some species such as Horsfields would also do well with some soft sand being added to the soil too, in a 60/40 soil/sand mix. Should I use a heatmat? Providing your home is of a sufficient temperature for humans to live comfortably within, the chances are you won’t need any supplementary heating for the enclosure as the heat bulb should be enough. Furthermore heatmats can be problematic with tortoises trying to thermoregulate, and as such should not be recommended anyway, unless they are used vertically like mini-radiators. They should never be used on the floor of the enclosure. What about heat and light during the night time? For most species commonly kept, such as Hermanns, horsfields, spur-thighs, etc a night time drop in temperature is perfectly normal and will mimic their wild environment. Therefore the lamp should be switched off and the enclosure allowed to cool down to normal ambient room temperatures on a night. How do I clean it out, and how often? The best way to clean out the enclosure is to use a dustpan and brush method. Disinfecting can be done (if necessary) once all of the substrate has been removed, with a pet-friendly mild disinfectant. Usually for x1 baby tortoise a full clean is only necessary once every 4 to 6 weeks, providing mini-cleans are done daily to remove any waste. 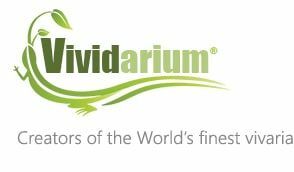 I see your information says that an oval design enclosure such as the Vividarium Tortoise Home is better than a traditional rectangular tortoise home. Why is this so? Tortoises, especially young ones, tend to have a habit of trying to climb right-angled corners. They usually use the two sides to “chimney” their way up, often falling on to their backs in the process. An up-ended tortoise which can’t flip back over can die of heat exhaustion within minutes if they land under a heat source. Because our enclosure is oval and therefore has no acute angles it cuts the risk down of this phenomena happening considerably.